We had so much fun this morning watching the webcast of the ALA Children’s Media Awards. There were seven of us around the table, focused on the big screen and munching on snacks. So, how did we do? Well, the mood in the room was pretty festive, since the children’s book nerds were very happy with the committees’ choices this year. This doesn’t always happen, I am sorry to say, and last year was a great example of a morning spent saying, “What were they thinking?” Not the case this year. The Printz award is announced fairly early in the ceremony, and Midwinterblood took the prize! You have never seen anyone so glad to have posted a review on time! I really loved this book, as you can see from yesterday’s hasty review, and my friend Danielle was just as pleased. My beloved Eleanor & Park took an honor, so I can be satisfied with that. E&P also won an Odyssey Award for audiobooks, and since I listened to this title originally, I can heartily agree: the production was fantastic. In a surprise move, the Printz committee gave an honor to Navigating Early, which was one of my top Newbery choices. Interesting. I am glad to see this beautiful book recognized. P.S. Be Eleven, the distinguished title that caused such an emotional response for me, took home the Coretta Scott King award, and well deserved, too. We were also glad to see Markus Zusak, the author of The Book Thief, take home the Margaret A. Edwards award for lifetime achievement in writing for young adults. He is a wonderful writer, and so young for a lifetime achievement award of any kind. Now if only he would write some more! Lots of favorites in the Caldecotts. I did not write about these picture book awards, but Locomotive, which won, and Journey and Mr. Wuffles, which took honors, were favorites of mine. Locomotive is actually a very beautiful nonfiction book. Your little ones would really enjoy these. 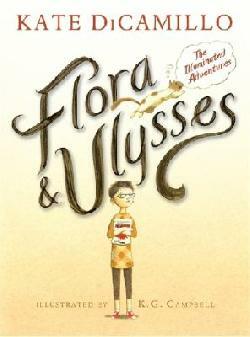 Finally, the Newbery Award went to my beloved Flora & Ulysses! It was an early favorite for me and kept my heart all year. I am so pleased to see that the committee agreed with me. I can’t imagine a child who wouldn’t be enchanted by this story. The Year of Billy Miller, also a younger choice, won a much-deserved Newbery honor. All in all, I was so thrilled that I could hardly think of anything else for hours, as you can ask any of my co-workers who, being adult services people, were not quite as emotionally invested as I was. For more details, you can search for my individual reviews of these titles. Now, go out there and put holds on all of these great books for your family!